One of the most upsetting and inconvenient side effects of chemotherapy is hair loss. A potential solution to counteract this hair loss is by cooling the scalp, which is exactly what the DigniCap aims to do. Dignitana claims that the clinical trials performed in Europe and Asia demonstrate that eight out of ten women who used the DigniCap system for chemotherapy were able to prevent hair loss. Hair loss is quite possibly the most common complaint and inconvenience associated with chemotherapy. Finding a solution to counteract this effect has been in popular demand. Digitana, from Lund, Sweden, has stepped up to the plate and begun the process to help provide cancer patients a solution. 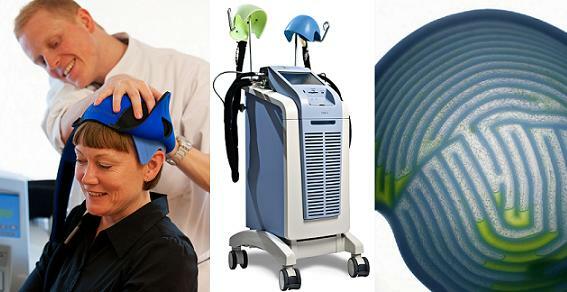 Digitana has begun FDA testing for clinical use in the U.S. "The DigniCap system is designed to help prevent chemo-related hair loss and consists of a touch screen equipped cooling and control unit that monitors scalp temperature and delivers cooling liquid beneath the inner cap." It helps counteract hair loss by narrowing the blood vessels around the hair follicles, which decelerates the uptake of the poison to the region. Dignitana claims that the clinical trials performed in Europe and Asia demonstrate that eight out of ten women who used the DigniCap system for chemotherapy were able to prevent hair loss. Extra trials at medical establishments throughout the world have found the system to be a proven method for chemo-related hair loss prevention for men and women of many ethnic backgrounds. In the past, cooling systems and cold caps have not found use in the U.S. due to concerns that cooling of the scalp could allow for cancer cells to hide in the scalp. University of California, San Francisco’s Hop Rugo claims that the incidence of scalp metastases in breast cancer is extremely low. In a large review of published data on cooling systems, he found that scalp metastases did not rise. Rugo and his colleagues are carefully watching patients use of these systems in several clinical trials. For more information about the DigniCap, click here.